Heat the oven to 190C/375F/Gas 5. Line 12 cup muffin tin with muffin paper liners. In the large bowl combine flour, baking powder, salt, cinnamon, baking soda and sugar. Melt the butter and allow to cool. Mash the bananas with a fork or just simply with your hands. In a second bowl mix together beaten eggs, vanilla extract, melted butter and milk. Add the mashed bananas and stir through. With a spoon or with your hands lightly fold the wet ingredients into the dry ingredients until just combined. Don't over mix it. Are you using a blender? 1-2 seconds are enough. Spoon in the mixture in paper liners until almost full. Bake about 25-30 minutes or until a tester (toothpick) inserted in the center comes out clean. 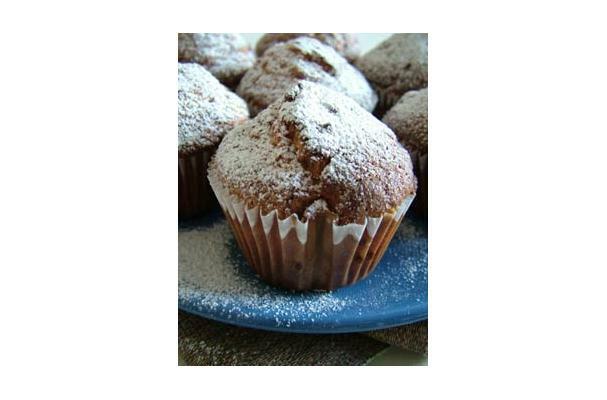 Leave muffins to cool for 10-15 minutes while still in the moulds before serving. Have you got a bunch of a bit overripe bananas? Well, don't through them away, that would be a terrible waste! They are a good excuse to bake delicious banana muffins. They are easy to make and don't require any special cooking skills. What I really like is a short time to make the batter so I can bake them just before my friends come for a visit or before breakfast.